eBay is arguably the biggest international firm with a significant presence in Indian e-commerce market. But given its business model (it doesn't sell products/services to consumers directly and is a platform or marketplace, as the industry lingo goes, whereas other retailers sell to consumers online) it is not restricted by existing norms that bar firms with foreign investors from selling to consumers online or through physical stores. So it is not directly impacted by the changes in foreign investment norms cleared by the topmost decision making body of the Indian government last week. However, the way one interprets the new rules will have an indirect impact on the e-commerce business in India as also eBay's future business in the country as new players such as Wal-Mart and Amazon come into the picture. eBay's country head for India Muralikrishnan B who took over the reins of the eBay portfolio in India, Philippines & Malaysia early this year, says Indian Internet firms are waiting for clarification from the government on what the new policy means for online retailing and its impact. "At the outset, everyone has been waiting for FDI in multi-brand retail for a long while. For those of us in the industry, the first question we asked when we heard of new FDI modification on multi-brand retail was how it would impact us. But it was silent on implications on e-commerce," according to Muralikrishnan. India's Commerce, Industry and Textiles minister Anand Sharma had said last week that the government will look into the online retail business, without giving any details as to how the FDI norms will impact e-tailing in India and whether the new norms (which are yet to be implemented) apply to e-commerce also. 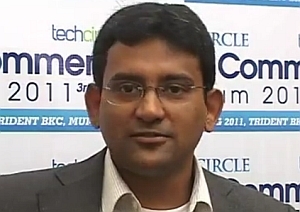 Muralikrishnan said the government should spend time analysing e-commerce. "This shows the fact that the government has not recognised the growing presence of e-commerce in India. It is still a grey area. But they have now taken cognizance of this fact and said they will include e-commerce, which is the right move," he said. He pointed out that the world's largest retail company, Wal-Mart, is a 'brick and click' entity as it has both physical stores and online retail model. "How Wal-Mart will interpret regulations in India is to be seen. The regulations are unclear," said Muralikrishnan. This is particularly important as the government has announced that foreign owned retail ventures will be allowed to operate in cities with population of 1 million or more. Since e-commerce firm can be set up in any remote location but sells to consumers across India, the implications for e-tailers needs to be clarified. The eBay India chief also pointed to the fact that several private equity firms have invested in firms that already offer B2C retailing in India . "How are they doing it?" questioned Muralikrishnan. Indeed, many Indian e-commerce firms have foreign investment through innovative financial and corporate shareholding structures. Most of the firms Techcircle.in contacted for views on how FDI in retail will impact their business were cautious on commenting on the development. Flipkart's co-founder and COO, Binny Bansal, said, "We welcome the developments in the sphere of FDI. We believe this will go a long way in improving efficiency in supply-chain and also invite investment in relevant areas. It will bring down the overall costs in the system â€“ leading to larger benefits for the Indian consumer. As far as the e-commerce sector is concerned, we are already witnessing significant investments in supply-chain and technology and we expect this to get a further boost going forward". Muralikrishnan said, "We welcome more competition but we need more clarity. Especially since the industry is in its growth stage and will only get more exciting in the years to come."